The creative team between Isabelle Soum, textile designer and photographer, and Xavier Brisoux, knitwear and fashion designer, was born from a mutual desire to collaborate expressed when their work was exhibited along one another in a collective exhibition. Xavier Brisoux was attracted to the poetry of Journey of a Drop, a series of photographs from Isabelle Soum where the textiles look like abstract paintings. Both creativities echo each other, and a desire raised to define a new work process that would bring the artists together with the will to maintain the strength and fragility of Isabelle's photos. A search for a common ground, a medium that join the two creative works was yet to be found. In Journey of a Drop, what seduced the knit designer is the fact that the textile material is sublimated by a drop of water acting as a magnifying glass. The fiber then becomes abstract. 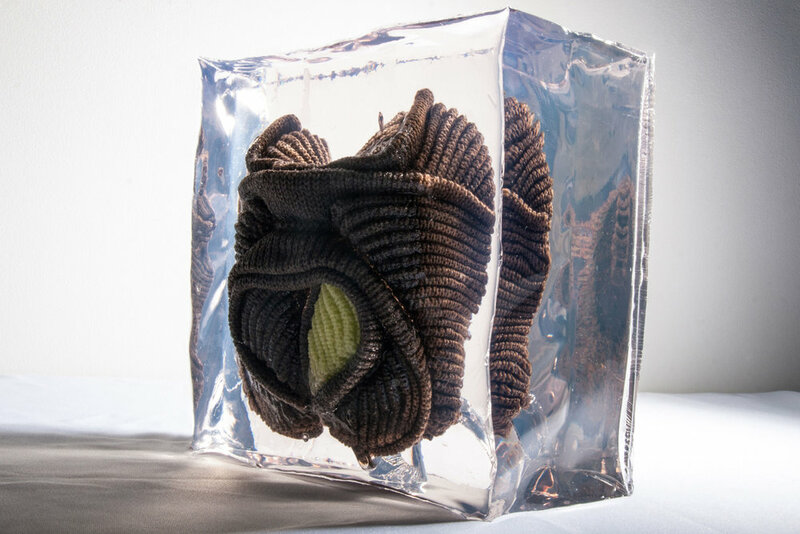 In his latest work, Xavier Brisoux is exploring organic forms and new ways of knitting to form sculptural shapes. It is by dipping knitwear into resin that the two artistic sensitivities come together: the resin becomes the liquid magnifying the knitted stitches. 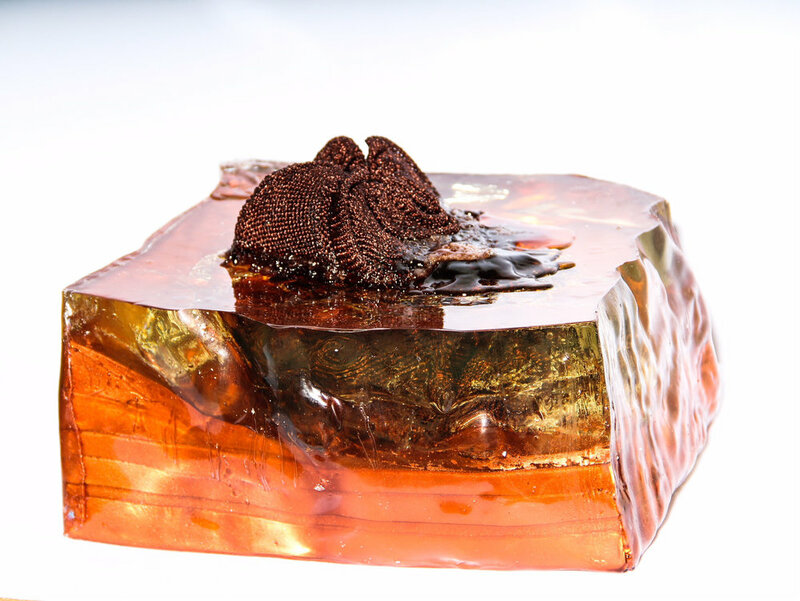 From then on, the two collaborators design together: he knits abstract shapes she turns them into resin sculptures. She brings her expertise in colour, he is challenging his techniques. It is a parallel and symmetrical work: each of them has a defined task but the two work in mirror, consult each other to define new shapes, new colours, other textures, and further processes. Lines are blurred, layers of resin intertwine with layers of knitting. The subject steps out of its box, the sculpture goes out of its frame, erases it and sublimates it. These pieces created by the artistic duo of Xavier Brisoux, knit artist and Isabelle Soum, textile artist are made in different steps. It always starts by a knitted volume in cotton. Then the knit is dipped into resin. Either the duo dip it into a cube, making it look like a ice cube, and therefore make the piece look like archeology. Or they proceed in a different manner which consists in making a cast out of another piece of knitwear. Multi-talented Isabelle Soum work on different mediums. After studying textile design in La Ruche in Paris, she takes on a photography course. Her fields of expression are diverse but are always based on colour, light and textures. She sees colour as an “adequacy of light”. Colour and light are at the core of Isabelle Soum’s artistic approach. They are the elements that define space, its perception, and the emotions of the viewer. The designer claims an independence from the universal rules of colour - like the chromatic circle - to claim the individual sensibility of each person. Isabelle Soum’s materialize light, offer new colour associations, fathom what is by nature impalpable. The photographer envisions colour as what it is physically: a wavelength. Her creative approach focuses on a variation of mediums and the idea that colour can become a faceted way of expression through materials, paintings, and various pigments. Primary colours are challenged on a variety of materials to give an infinity of nuances, variations and possible combinations which become her artistic playground. Once established and staged, the very concrete colorimetric coordinates become polychromic poetry. This lyricism is further amplified when photography takes over to emphasize and exacerbate elements undetectable to the naked eye. It is through this technique that Isabelle brings another dimension to her chromatic work: light, another essential vector for the textile designer, brings depth to her colour chart. For Isabelle Soum, photography is a powerful mean to create and develop a personal conceptual approach in order to master the creation of an entire strong textile image. Her way of working with lighting underline the contrast and the modelling. Volume is achieved by highlighting the forms. The essence of this whole creative process is to materialize a triangulation of primary colours into a wavelength and then to capture the movement of this vibration to make it live in a work of photographic light. A knitwear designer from London’s Central Saint Martins' MA Fashion course, Xavier Brisoux designs collections where knitting is built like a story: yarns are used for words, the stitches for vocabulary, the theme becomes the fabric. Knitwear is poetry and concept for him as he mixes material and technique to structure the idea. He often draws his inspiration from history as well as from the general and founding myths, from which he derives his knitted textiles stitch by stitch. One of his collection was for example based on Penelope, the weaver-unweaver wife of Ulysses. His mastery of knitwear allows him a total control of possibilities: de-knittable sweaters, challenging constructions and sculptural stitches. Brisoux knits this territory of an all-is-possible with an apparent nonchalance. After having developed his own collections for several years, the knitter questions fashion and its cycles, and starts working with a different perspective. For him, it is now more important to work towards perfection than towards a deadline. A new long-term project is born. It is then a matter of creating knitted armours where he pushes the technique and the craft into the boundaries of their fragility. The Achille's Echo series is born. The myth of the Trojan hero is at the origin of this research. It aims at conveying the fragility behind an apparent invincibility, to draw a futuristic look inspired by the ancient Greece myths while assuming other historical and fashion references, and to enhance the anatomical aspect of the armour in parallel with the organic appearance that they adopt when they are not worn. Xavier Brisoux sets himself as the Hephaestus of Knitwear, shaping unique pieces with the acceptance of the time necessary for creation, its trial and errors. It is important that the garment besides being a technical feature becomes an architectural challenge. When Xavier Brisoux meets Isabelle Soum, he has started creating knitted shapes that are becoming objects more so than garments.